Underarm Pads by Natural Wheel are a strong barrier between the delicate tissue of the underarm and any type of the clothing that helps keep clothes dry and clean. -Easy and comfortable to use. - Keep your most sensitive body parts free from chemicals components, especially if you are susceptible to allergies. 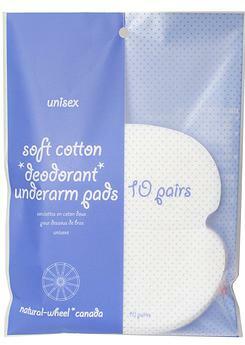 Underarm sweat pads are used for odor absorbency and reduction. Hypoallergenic and soothing, for those with sensitive skin. Perfume- and scent-free. Suitable for breast feeding moms.